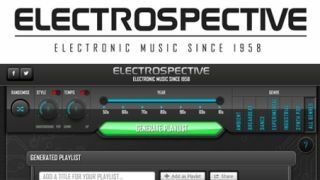 PRESS RELEASE: Electrospective, the multi-platform celebration of electronic music from 1958 to the present day, has added another string to its bow - the Electrospective Spotify app. Pop, classic rock, jazz, metal, and classical music are all already catered for amongst Spotify's apps - Electrospective fills the gap for fans of everything from synth pop, ambient, breakbeat and dance to experimental and industrial. The app's home page offers event driven playlists, such as the set list from The Human League's recent Kew Gardens shows, artist curated playlists from the likes of Mute records founder Daniel Miller and artist focused playlists such as the Daft Punk collaborators playlist. Want to look back through the ages of electronic music? Head to The Electrospective tab and navigate your way through the complete retrospective of 550+ albums. Too much music for you to take in? You can of course scale it back by selecting different decades and sorting by artist or specific sub-genre. The real power of the app lies in its Playlist Generate function. Turn the style to your preferred setting (underground to pop, or anything in between), select the tempo, choose from a selection of sub-genres and a time span from the past 50 years. One click on generate and the app creates a bespoke playlist for your to listen to there and then, or save for later. The app is the latest offering from the Electrospective project which was launched last Summer to bring together the extraordinary wealth of electronic music from the catalogues of Virgin, Parlophone, EMI and Mute. It chronicles the key works of visionaries like Kraftwerk and Brian Eno as well as the ground breaking success of Depeche Mode and The Human League, the explosion of electronic dance music in the late 80s and the rise of global stars like Daft Punk and The Chemical Brothers. The project is now being curated by the team at Universal Music Catalogue, with electronic gems from across Universal Music's labels due to join the already stellar line up. Electrospective kicked off last year with a 2-CD compilation, offering the listener a snap shot of the collection. Merchandise including iconic logo T-shirts and limited vinyl LPs were available to purchase from the Electrospective online store. A broader chronological selection was chosen for the Electrospective website which has a timeline highlighting key moments such as the invention of the Korg, Moog and Nord synthesizers, release of Propellerhead production software and the launch of online DJ store Beatport. Artist interaction has been central to Electrospective, both on an offline. Visionaries, tastemakers and influencers Daniel Miller (The Normal and founder of Mute), Andy McCluskey (Orchestral Manoeuvres in The Dark), Martyn Ware (The Human League/Heaven 17), Mark Jones (Wall Of Sound/Back to The Phuture), Matthew Herbert and Bill Brewster (DJ and Co-author of Last Night A DJ Saved My Life) came together at Abbey Road last July to talk about the influence and importance of electronic music. Other current DJs and producers such as David Guetta, Eric Prydz, Richie Hawtin and Paul Oakenfold have supported Electrospective by giving interviews and taking part in webcast events.